Sudairy gives Conant a driving lesson in Arabic. The “instructor” is from Saudi Arabia where women are not allowed to drive. The “student” is from the US where driving is very accessible, yet she got a license at the late age of 18 and hasn’t driven much since. Her license has lapsed and she now must go through the instructional process from the beginning. 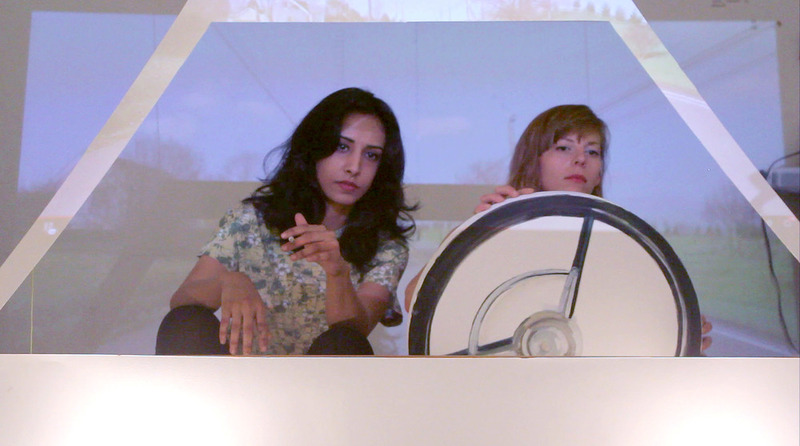 Echoing the absurdities surrounding their respective situations, the video features a fake car made of paper with an oil-on-canvas steering wheel, spliced with footage of a lesson shot in a real car.